Fell asleep after dinner. Here is my 10:30 measurement. I will call it a foot, camera angle pointing down cheated the tape a little. I know that there was more out on the road, so lets go foot plus. The last two inches was very puffy and will settle. It was still snowing at sunset (5:17) and the radar shows more on the way. I took the snowblower down the private road to start on spots that are too full for the plow truck to throw the snow over the banks. There is a solid foot on the private road. The county road had been plowed at least once, but there was lots of free snow and the sides weren’t done. Those guys have plenty to do today. That is definitely not a criticism. The TV says another 2-3″ before it is done. The radar looks like it is very possible. Here is my latest measurement on the car-9″. The 25″ is in a sheltered area between the camper and truck. It is about what I measured on the camper roof too. There is a dry slot forming in the storm and getting bigger. Usually that indicates that the end is near. 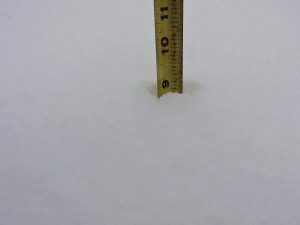 It is still snowing and another inch or two is likely. I deleted earlier snow depth pictures due to high server load. 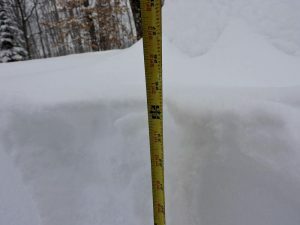 I cleared the upper driveway right after my 1pm update. 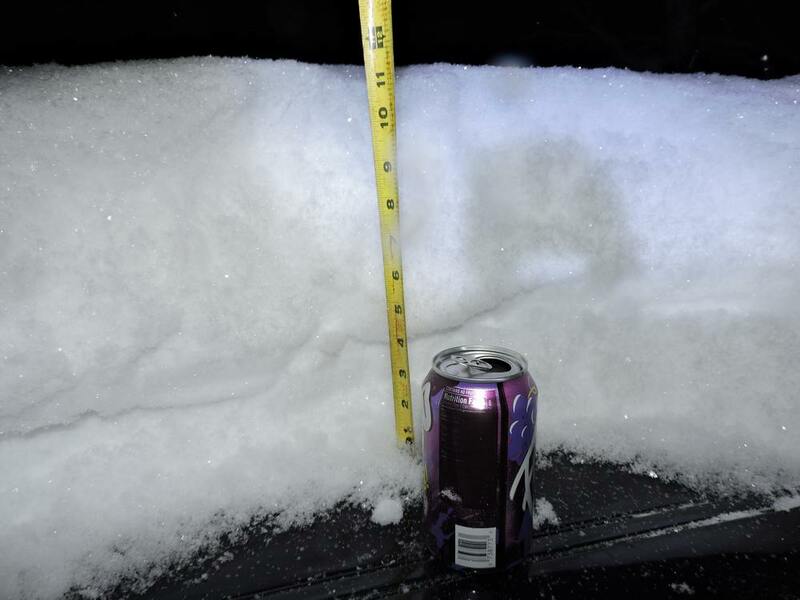 There is about 2″ of new snow on it since then. Good golly there is a lot of snow out there. The snow has changed from tiny flakes to bigger ones and it is falling at a decent pace. Now it is adding up fast. I did not get a chance to do snow removal after Sunday’s 3-4″ so take that off of the tape measure picture that shows 9.5″. 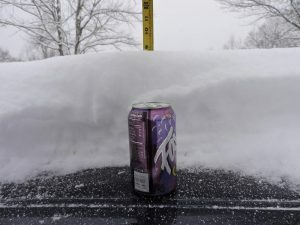 The soda can is on my car, which was clean when it started snowing. I am estimating that I have about 4-5″ down. The back step was 4″. I never had a chance to clean up Sunday’s snow so it is a challenge to measure the new stuff accurately. I cleared the back step last night. Between that and the car I should be able to measure it once I go out to clear some of it. Going out to do that soon while it is still manageable. It just started snowing like it means it in the last 20 minutes. We are under a winter storm warning. Depending on which NWS warning or forecast that you pick we are in for 10″ or 9-13″. The warning says snowfall rates of 1-2″ per hour and gusty 25mph winds. The TV says 3″ by 7am and 10.5 overall. Someone e-mailed overnight and asked about how much snow is on the roof. My e-mail is being funky at the moment so I will answer here. 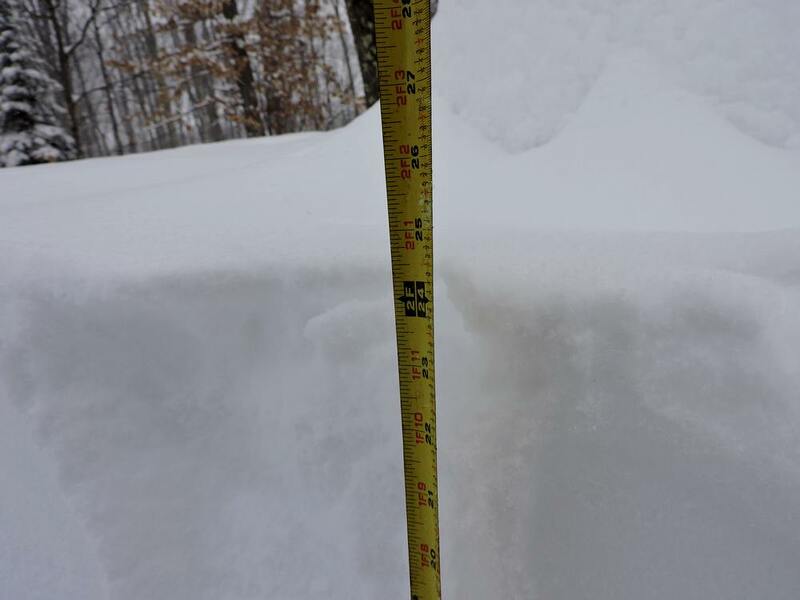 My guess is about 30″, and it is compacted snow plus the ice base. I am pretty worried about my roofs. Here is a picture of the camper roof that I just took. I worked all weekend and again Monday, so I haven’t had a chance to deal with it yet. Looks like today is the day. I did find a couple of guys that will shovel roofs. Use the contact form and I will get you their number. I also have concerns about my 1/4 mile of driveway. The piles are very high and it is getting very narrow. Parts of it I need to use the snowblower because the truck can’t throw the snow up the banks. I did not have a chance to clean up Sunday night’s 3-4″ and it is snowing again. I really have my work cut out for me today. I will do updates over the course of the day.